In this lesson, we will learn how to find the median and upper and lower quartiles of a data set. A The median is 68, and the quartiles are 50 and 84. B The median is 68, and the quartiles are 52.5 and 79.5. C The median is 71, and the quartiles are 55 and 90. D The median is 69.5, and the quartiles are 50 and 84. 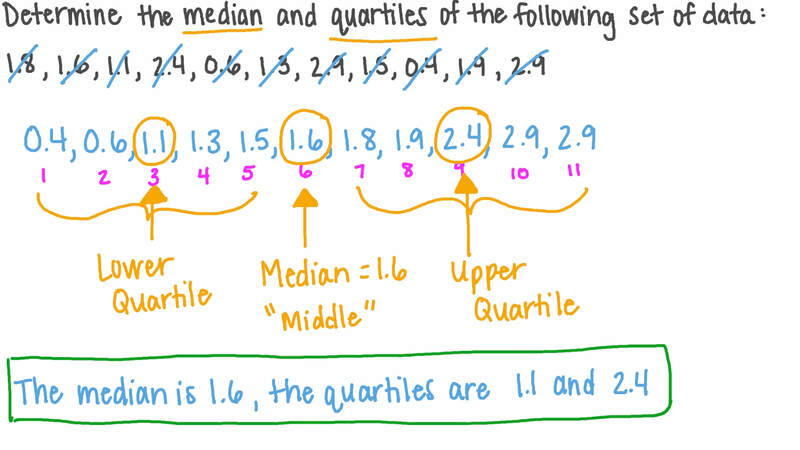 Determine the median and quartiles of the following set of data: 1.8, 1.6, 1.1, 2.4, 0.6, 1.3, 2.9, 1.5, 0.4, 1.9, 2.9. A The median is 1.6, and the quartiles are 1.1 and 2.4. B The median is 1.6, and the quartiles are 0.6 and 1.9. C The median is 1.8, and the quartiles are 1.1 and 2.4. D The median is 1.6, and the quartiles are 1.3 and 2.9. Determine the upper and the lower quartiles of the following set of data: 114, 103, 50, 52, 95, 103, 93, 53, 65, 57, 52, 89, 111, 89, and 96. A set of data’s minimum is 3.44, its lower quartile is 7.42, its median is 7.74, its upper quartile is 14.02, and its maximum is 17.74. Between which two values does the middle 5 0 % of the data lie? The table shows the capacities of 6 sports stadiums around the world. Describe how the lower quartile will be affected if Emirates Stadium, London, United Kingdom, which has a capacity of 60,338, is included in the data. AThe lower quartile will remain unchanged at 42,055. BThe lower quartile will increase from 42,055 to 86,047. CThe lower quartile will increase from 42,055 to 42,058. DThe lower quartile will decrease from 42,058 to 42,055. EThe lower quartile will remain unchanged at 42,058. 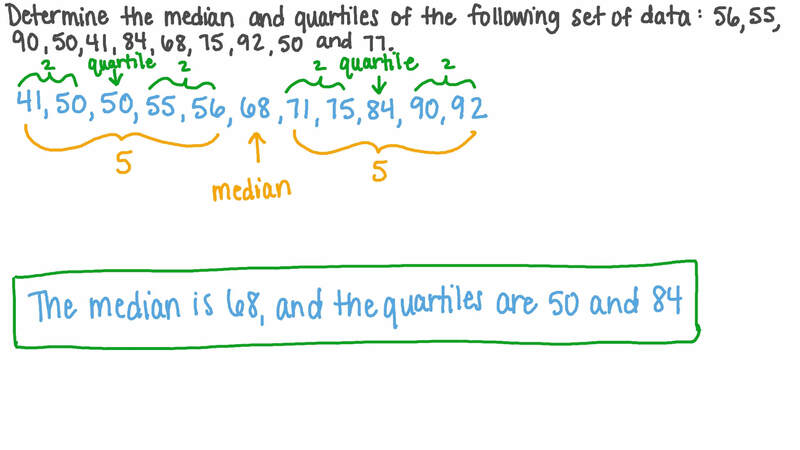 Determine the median and quartiles of the following set of data: 1 350, 1 400, 1 250, 1 050, 1 450, 1 150, 1 000. A The median is 1 250, and the quartiles are 1 050 and 1 400. B The median is 1 250, and the quartiles are 1 150 and 1 350. C The median is 1 350, and the quartiles are 1 050 and 1 400. D The median is 1 250, and the quartiles are 1 100 and 1 375. Determine the upper and the lower quartiles of the following set of data: 19.4, 42.1, 56.1, 27.5, 5.3, 49.9, 48.8, 44.3, 13.1, 15.4, 20.1, 4.1, 38.1, 33.8, and 41.5. Karim’s history test scores are 74, 96, 85, 90, 71, and 98. Determine the upper and lower quartiles of his scores. Sameh’s scores in a card game were 4, , , , , 7, and 0. Determine the lower quartile and upper quartile of his scores. Select the pair of data sets which have the same median and quartiles, but different ranges. The table shows the savings of a group of 8 children. Determine the lower and upper quartiles of the data. The table shows the number of students who partake in different physical activities. 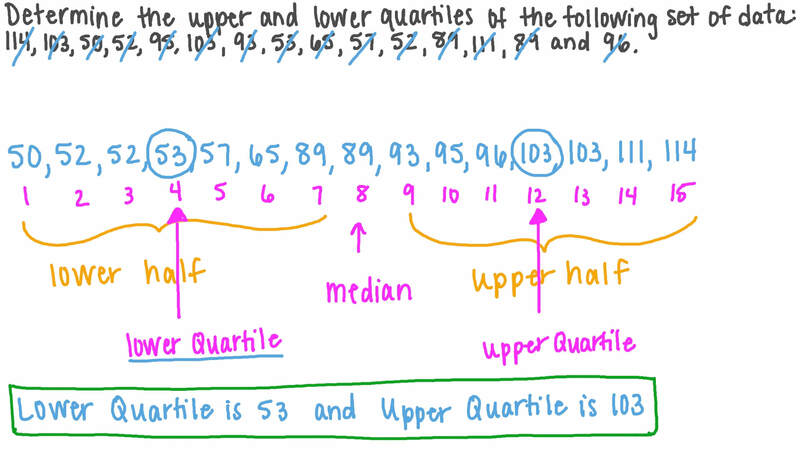 Find the lower and upper quartiles of the data. The table shows DVD prices in dollars at various shops. What are the lower and upper quartiles of the data?